The term Shinto, which is translated as "the way of the gods," was not coined until the nineteenth century. Because Shinto, unlike Buddhism, has never been an organized religion or tradition and has no official doctrines or creed, its ideas concerning death can vary widely from one individual to the next. This entry makes references to kami, or native Japanese deities, as representative of the Shinto tradition and focuses on these deities as core to Shinto thought. No moral notion of sin exists in Shinto. Death is not the "wages of sin," that is, the outcome of evil-doing. Rather, because purity is valued above all else, evil is defined as that which is "pollution." The primary pollutions are sickness, blood, and death. When kami are offended because of exposure to pollution, they can create disasters such as plagues and famines. Consequently, Shinto shrines usually do not conduct funerals. This tradition is evidenced in the familiar adage, "Shinto for weddings, Buddhism for funerals." 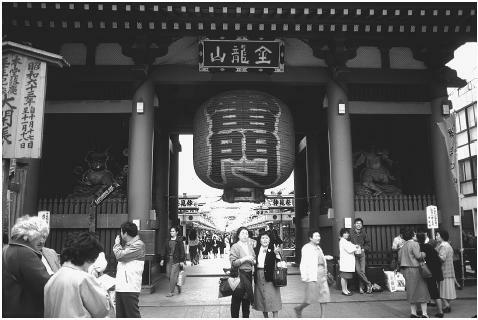 Asakusa's Sensoji Temple, said to be the oldest in Tokyo, was dedicated to the Goddess of Mercy, Kannon. Statues of the gods of wind and thunder are on either side of the Kaminarimon Gate. these souls back to their homes in August at the Obon festival. Usually, however, after thirty-three years deceased ancestors are no longer considered. There is no concept of an eternal soul in Shinto. Two of Japan's oldest texts, the Kojiki (Record of ancient matters, 712) and the Nihongi (Chronicles of Japan, 720), tell the story of Izanami and Izanagi, the two kami who created Japan. After Izanami dies giving birth to the kami of fire, she goes to a place called the Land of Darkness (known as Yomi no Kuni ). Her husband misses her so badly that he follows her, only to be shocked by Izanami's advanced state of decay. He flees the Land of Darkness, stopping at a river to cleanse himself on his way back to the land of the living. This early story emphasizes the Shinto understanding of death as pollution. Occasionally deceased people have become kami, when the deceased were thought to be angry with the living or because of the circumstances surrounding their deaths. The most famous example of such a kami is Sugawara Michizane (845–903), who was exiled to Kyushu, a southern island of Japan, in 901 because he was viewed as a political threat by the scheming regent. Shortly after Michizane's death a number of disasters struck Japan, which were thought to be caused by his angry spirit. To pacify him, he was recognized as a kami and enshrined in Kitano Tenmangu Shrine in Kyoto in the middle of the tenth century. In Japan's Meiji period (1868–1912), a time of extreme nationalism, leaders adapted Shinto ideas to fit their political agenda. Tokyo's Yasukuni Shrine, established in 1869, enshrines the spirits of all the Japanese war dead since that time. Nevertheless, most deceased persons in Japan are not regarded as kami, and most Japanese turn to Buddhism for answers to problems concerning death. Aston, W. G., trans. Nihongi: Chronicles of Japan from the Earliest Times to A.D. 67. 1924. Reprint, New York: Paragon Press, 1956. Ono, Sokyo. Shinto: The Kami Way. Rutland, VT: Charles E. Tuttle, 1962. It's not clear from this article, but Obon is actually a Buddhist festival. What does Shintoism say about the soul? Do poeple believe in it?